The Baptist Church, as one would maybe expect, is in Chapel Lane - the road running from Goose Green on the A337, to the A35 close to Swan Green. (It is shown by Richardson, King and Driver in the late-18th century just above the large 'I' in the centre of the accompanying map, but is not marked as church or chapel). The present building dates from 1848, although some of the tombstones go back to the early 18th century, a reminder that the site has been a place of worship for over 300 years. The church was, in fact, founded towards the end of the 17th century as an Ebenezer Chapel - Ebenezer in Hebrew means "stone of help". Little is known of the first building, which was replaced in 1755 by the second that in turn gave way to the present chapel. Over the years, church fortunes have varied. In 1827, there were apparently only 2 church members and one of those was ill! 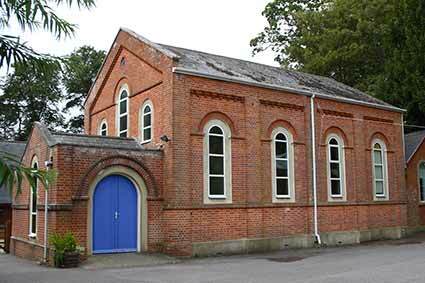 Membership had risen to 11 by the end of 1828 and to 41 by 1841, when a new vestry was built. Following construction of the present building, a gallery was added in 1851. The schoolroom at the rear of the church was constructed in 1892 to accommodate a growing number of children attending Sunday School. The porch was added in 1984, and the church hall, which replaced a 1950s building, was constructed in 1998. Details of services can be found at this link. Ponies, cattle, pigs, sheep and donkeys are a popular part of the New Forest scene, but during the first six months of 2018, 36 animals were killed or injured on Forest roads, compared with 26 in the same period in 2017, a shocking rise of 38%. And in the full year, 63 animals were killed on the roads compared to 56 in 2017.